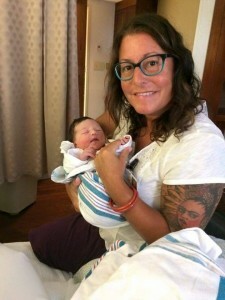 For my third post in this series, I would like to extend a warm welcome to Monique Klapka, a Certified Nurse Midwife. Monique attends births at UM St. Joseph Medical Center in Towson, MD, as a member of Women’s Health Associates. I have been impressed every time I have seen Monique in action, caring for not only the patients of her own practice, but also working triage and covering the L&D Unit for obstetricians who are in surgery or not yet on the floor, and giving all of the women her full attention and excellent care. I became a CNM in 2002. Prior to that, I was a certified doula (1995) and a labor and delivery nurse in 1998. I did my doula training at Mercy Medical Center. I have two bachelor’s degree’s – the first from Hood College, the second was my bachelor’s in nursing from University of Maryland. My master’s degree and midwifery training were through Philadelphia University. When I was doing my training as a midwife, I did deliveries in both home and hospital settings. As a CNM, I work full time doing hospital births, but in 2009, I spent three months working with a midwife in rural Mexico, doing deliveries in the home. I went into midwifery from a feminist standpoint…I wanted to provide care to women that allowed them to make informed decisions about their own health. I see myself as a facilitator, a guide, an advocate for women in labor and birth. I support women who choose to give birth in different environments – but I myself, am more comfortable with the safety net of a hospital setting – safety net meaning that there is immediate access to physician backup and NICU support in the event of an emergency. I do not have children, only cats. But I don’t think that not having children makes me any less capable in my role as a midwife or in understanding what a woman is going through in labor. Choose ONE thing…that’s hard….To have an open mind and to be flexible. For most people, birth is a normal process. But in some instances, things may not go as planned. If this is the case, I want them to trust in me to be there as their advocate and guide through the birth experience. It’s not a failure to be induced or if a CS needs to occur. The gift is a healthy baby and knowing that you were well cared for an supported along the way. Thanks so much, Monique! For more information about Monique or the other midwives at Women’s Health Associates, check out their facebook page, www.facebook.com/WHA.Midwives, or UM St. Joseph Medical Center.